The second chapter of Sierra's episodic King's Quest reboot, Rubble Without a Cause, will be out on December 15th. And if you think that subtitle is groan-worthy (as we did), you're going to absolutely love this bit from the announcement. "Will Graham & his friends unearth a way to escape their rock-brained captors? Will he take for granite everything he learned as an adventurer? Does he have the stones to reclaim his mantle & lead his kingdom to safety?" To be fair to all involved, it's par for the course for the King's Quest series, which in the past has given us titles like To Heir Is Human, Absence Makes the Heart Go Yonder!, Heir Today, Gone Tomorrow, and The Princeless Bride. 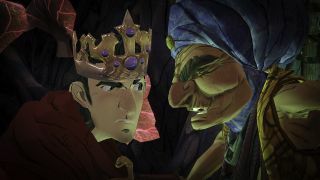 The new King's Quest is more of a cinematic adventure, in which you have full control over the movement and actions of King Graham, than a conventional point-and-clicker as the originals were. It maintains the narrative thread, however, as the aging Graham shares memories of his past adventures with his granddaughter Gwendolyn. The second chapter will see the newly-crowned King of Daventry set off on a daring mission to save his people from a band of goblins that's causing no end of grief for the kingdom. A price for the next chapter wasn't announced, but given that the first game in the series, A Knight to Remember, is $10 on Steam, it's a good bet part two will go for the same. The entire five-part King's Quest reboot is also available by way of a season pass, which is a bit of a deal at $40.